Software is the central ingredient of digitization. Innovative products and services are no longer conceivable without it. Competitiveness crucially depends on the ability to create software-intensive products and services quickly and with highest quality. 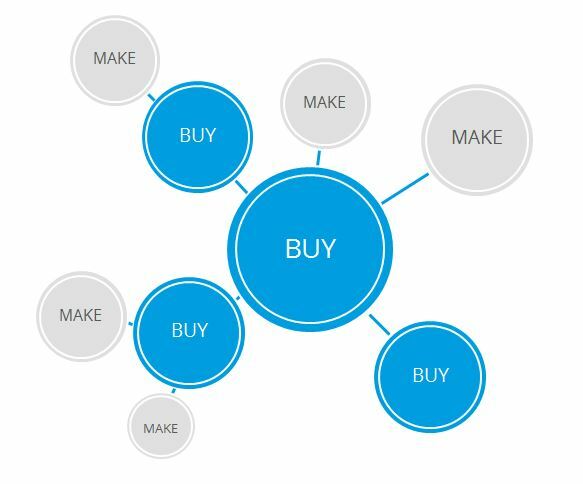 In software development, one therefore has to face the make-or-buy decision. Due to technological progress, many different possibilities to meet individual requirements are now available. 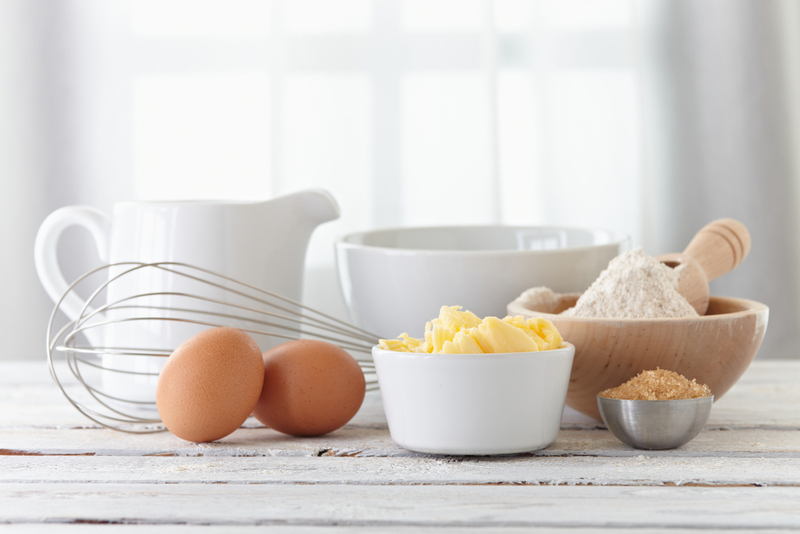 The BAKE approach reduces both buy-risks such as complete dependence, loss of know-how and incompatibilities of standard software as well as make-risks such as underrated development and maintenance effort and costs and a long time-to-market. At the same time, access to specialized knowledge offers the opportunity of greater innovation dynamics. Many well-known examples come from automotive development. The depth of production of the individual manufacturers is relatively low, many items are being purchased from specialists. This approach is also possible with respect to software development. Third party software components can easily be integrated – be it components coming from the development of other business units or solutions from the open source environment or from specialized software companies. Depending on the company’s focus and value added, dedicated components can also be reverse-engineered or purchased (= backward integration) as a follow-up. This can replace the “buy-component”. 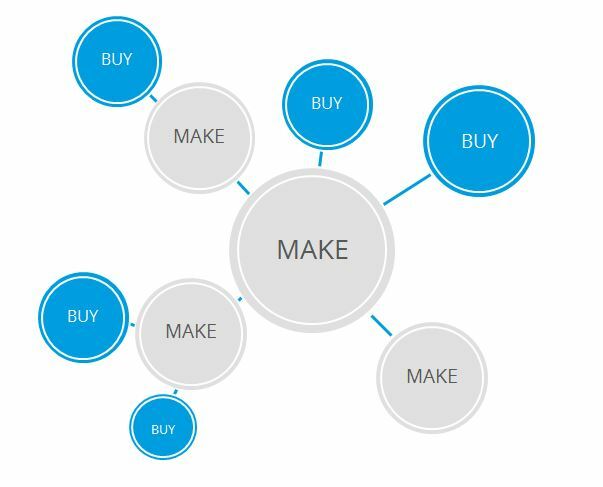 Software components in interaction in make + buy: Control remains within the company. Also in the travel industry – which is my primary sector of activity – many examples of in-house development in interaction with (existing) third party solutions exist. Among others in the context of national and international travel booking solutions, where diverse content interfaces for e.g. flight, hotel and car rental are required for development. At present, they are not available in a standardized form. 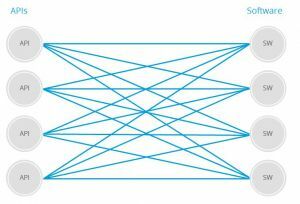 As a consequence, any required interface must be connected and maintained individually. 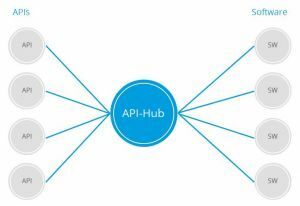 The API supplier therefore has to attend to many customers directly. 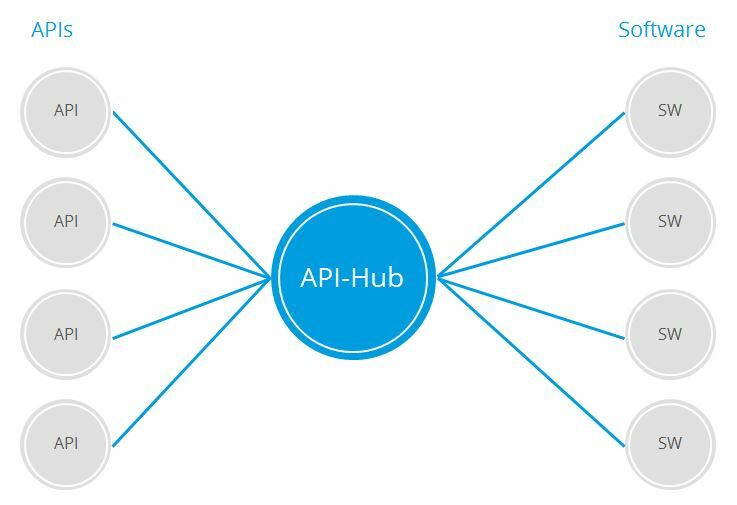 As a result, the market relies on API specialists who bundle content and offer it in a standardized form. 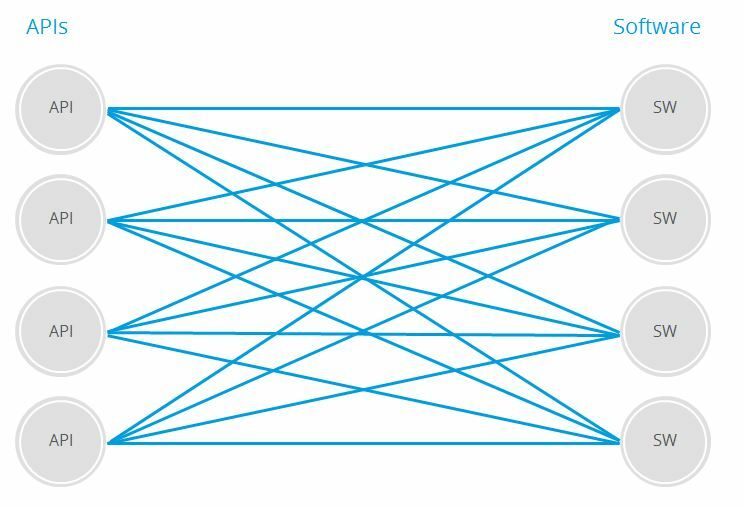 As you can see in the diagram, this simplifies not only the integration and communication during and after development, but also reduces complexity. Furthermore, this approach offers greater independence – a change or the addition of an interface can easily be done. If off-the-shelf solutions are no longer sufficient and in-house development does not make sense, new, individual solutions are needed. What was once unthinkable is now possible thanks to today’s technology: customized software for the price of standard software, based on reusable components. Often, we call this a modular system or white labeling: One selects the desired blocks, optionally builds further blocks or brings in own blocks. These can be integrated via e.g. a service manager or interfaces. Thus, a customized software is created in conjunction with own know-how. Specialized knowledge, which serves as a means of differentiation on the market, remains to 100 percent in the hands of the company. Software components in interaction: Individual modules / know-how integrated in a customized solution. Another practical example from the travel industry: The standard business travel booking system of a world-wide financial institution had reached its limits. With the standard set, the reproduction of travel rules became more and more difficult and time-consuming individual programming was necessary. The objective therefore was to implement software which could be supported and developed independently and without much effort. The choice fell on the PASS Online Booking Tool, which was developed as a flexible modular system: in addition to its component-based software development, it is primarily characterized by an integrated rules engine (open source). This enables customers – regardless of the manufacturer – to incorporate know-how and place it at the disposal of internal and external users. Good luck with baking or rather with software development!